The smoke has drifted away, and there is acceptance that this place has changed. There’s been time to get used to the idea. Everyone I work with has had to grieve for Table Mountain in their own way. The memories are ours to keep, and now it’s time to explore the new reality. The trail crew went to the Wilson Stock Driveway today. We are part of the Burned Area Emergency Response (BAER) effort after the Table Mountain fire. Our task is to create appropriate drainage structures to slow erosion on trails where the fire burned with great intensity. Without living trees to hold water, the damaged soil is more exposed to snow and rain and likely to erode. Running water is no friend to trail tread in the best of circumstances. 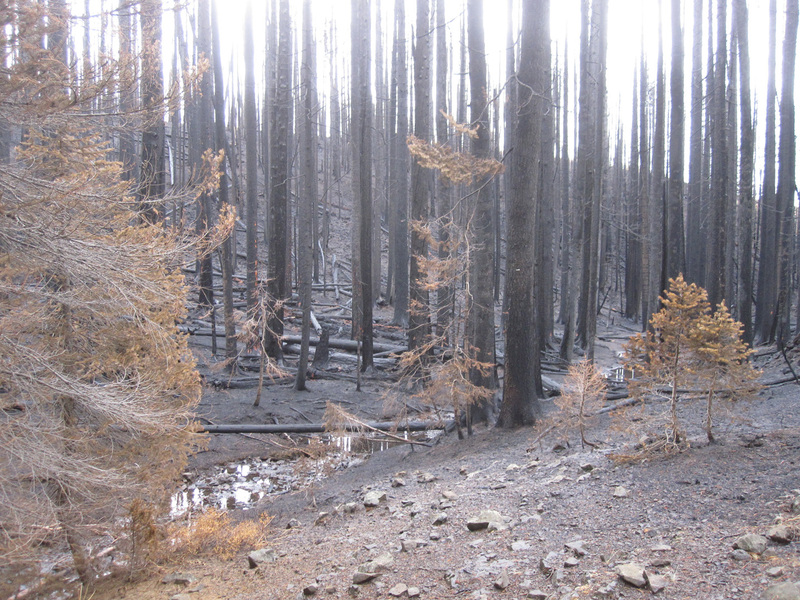 Burned areas are fragile, and we want to keep excess sediment out of streams. So we dig. The tracks of recent rain show us the right location to dig angled ditches to divert water away. It takes a practiced eye to see this, and deft handling of the digging tool. Table Mountain is capped with basalt, so there are plenty of angular rocks to scoop out. We quickly figured out that rock or wood check dams could also help slow running water. We moved slowly, often looking up into the naked ghost trees. It’s still a treacherous place, even though the fire is out. Trees burned through at the base or higher up. Many have fallen, and many are weakened. There’s no reason to spend time under leaners hung in dead branches. The fire burned hot here. I remember standing in Red Top Lookout almost two months ago, watching the plumes of black smoke rise into the sky. The billows increased all afternoon. I knew that if the firefighters didn’t catch it soon, they weren’t going to catch it at all. The forest on Table Mountain was high elevation subalpine fir and lodgepole pine. Fire behavior in this forest type is usually intense. The firs have branches that go all the way to the ground, and their crowns are full of black lichens. All it takes is a tiny windblown ember to turn the tree into a torch. That torch throws off more embers, and the fire moves through the tree canopy. All this fire sweeps life before it like a broom, clearing the way for a new stand of trees. 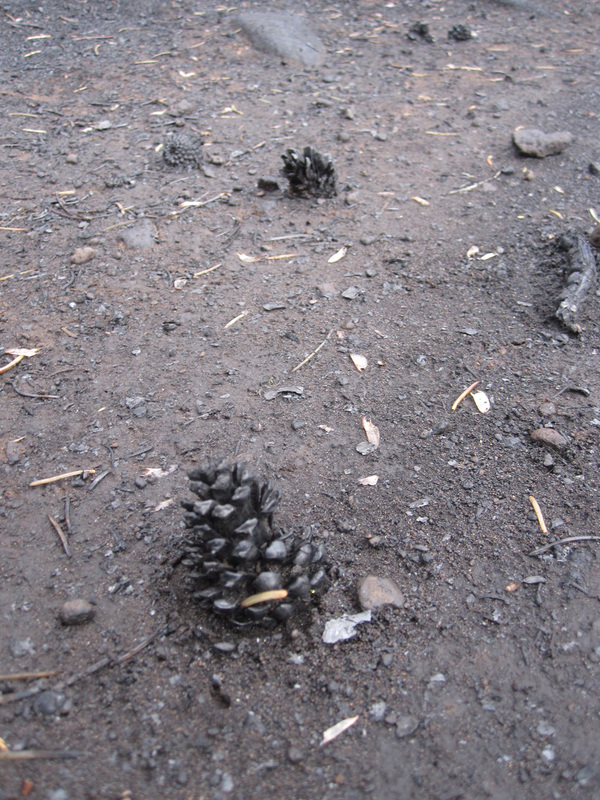 There were lodgepole pine cones on the ground. Some of them had opened and their small seeds littered the trail. I stopped to examine these and found every seed had been eaten out of the papery wings that disperse the seeds. The air was filled with the sound of nuthatches and chickadees foraging, and flocks of finches winging through the tree trunks. A black and white woodpecker (hairy?) flaked away singed bark. I heard squirrels in the distance. Surely there would also be mice and other little rodents scurrying around looking for something to eat. I heard ravens overhead. Deer, elk, and coyote tracks trailed through the soggy ash. All is not lost. Plants will come back. In the meadows, fire had moved quickly though the dried grass and green was already showing from some of the root crowns. Lupine seed pods were pasted to the soil by hard rain, and desert parsley seeds were scattered. Wild onion bulbs were exposed by our digging. Yellow aspen leaves stuck to the mud, blown by an upcanyon breeze. A few golden larches flared against the black, remnant patches of forest that didn’t burn. From these living tree islands, new forest will come. It looks like destruction. I loved Table Mountain the way it was, with its rolling trails winding from forest to meadow and forest again, the big basalt talus slopes, the variety of terrain. It was a great place to find wildflowers not seen anywhere else in the area. By burning away the vegetation, the fire also revealed that we have not been very good stewards of this place. I picked up some scorched beer cans but walked by broken glass bottles. Motorcycle tracks left the trail to loop through dry meadows. Tires had dug trenches. People made their own roads to hunting camps and to illegally cut firewood. The land belongs to the public, but we have not taught them to care for it. We turn a blind eye, demoralized by shrinking budgets and lack of will to stand for a greater good. We are all culpable. In the wake of superstorm Sandy, we wonder about global climate change. Why are there so many natural disasters? Why did this fire burn so hot, get so big? We are looking explanations, someone to blame, something to cling to in the midst of all this uncertainty. I don’t know much, except to put one foot in front of the other and dig to make water go off the trail. I know I’m upright and breathing and grateful. It’s not raining, and I’m with good people. I’ll go home, take off my muddy boots, make a hot supper and go to bed. And tomorrow the sun will come up and I’ll go out there to dig some more. Beautiful writing, as usual! Your descriptions remind me that change is the one constant in our lives and even though my work is vastly different than yours, we all can use your advice and outlook to keep on putting one foot in front of the other and be grateful for all we have. I love the line–The land belongs to the public, but we have not taught them to care for it. This is so true and seems to be such a simple thing to know but people can’t seem to grasp. Let’s hope they can soon. JoAnn, I think we can do a better job demonstrating what it means to be stewards of the land that belongs to all of us. Change seems to only happen one person at a time. We have to start somewhere. Pat, it’s a pretty amazing experience. Much to pay attention to and learn.